Heritage Hill presents a new event to our series “Healthy Hangouts @ The Hill”. 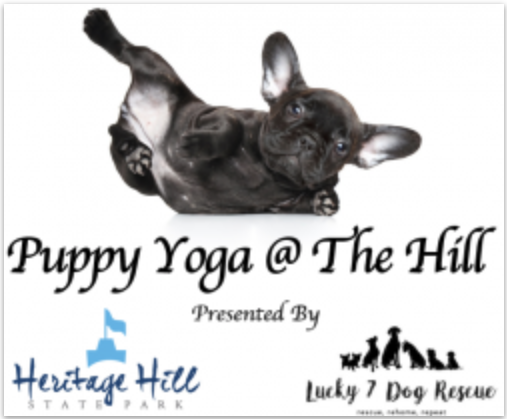 Join Heritage Hill and Lucky 7 Dog Rescue for an afternoon of yoga, puppy kisses, and laughter! This event will be held indoors within our Education Center. Bring your own mat, Lucky 7 Rescue will supply the puppies and certified yoga instructor. Mollie McCain will instruct a 1 hour yoga class – all levels welcome! – (this will be more of a beginner class) . Lucky 7 will be bringing in several puppies. Limited spots available, so register now! Special Admission Rates Apply: $23 ticket + $2.50 online processing and site convenience fee for all Adults & Children Ages 12+, Ticket includes 1 hour class. We would love to see attendees bring a donation for our special Lucky 7 Pups. A blanket, toys, treats, or food would be greatly appreciated. If you have any questions contact Heritage Hill State Park at 920-448-5150. Refunds will not be issued unless Heritage Hill cancels the event. Heritage Hill State Historical Park is a 501(c)3 non-profit organization. We are a living history state park devoted to the preservation of our buildings and artifacts and the interpretation of the history of Northeastern Wisconsin and its people. The Park opened in 1977 on a 54 acre site with 24 historical and reproduction buildings representing the early history of Northeastern Wisconsin from 1672 to 1940.